How interactive is architecture? These days, networked computer systems, tablets and smartphones seem to exemplify interactivity amongst people, and between human beings and objects. Mikael Wiberg provides this list at the start of an interesting article Interaction design meets architectural thinking, published recently in Interactions, the ACM magazine. It’s worth exploring at least one other thread connecting “architectural thinking” with (computer) interaction design: the thread is agon. “a question of rivalry which hinges on a single quality (speed, endurance, strength, memory, skill, ingenuity, etc. ), exercised, within defined limits and without outside assistance, in such a way that the winner appears to be better than the loser in a certain category of exploits” (14). In an essay in a new book, Phenomenologies of the City, architectural theorist Wendy Pullan draws attention to the role of agon in understanding architecture and the city. (I should say, she makes no reference to interactive computer games.) She explains the ancient term agon as used by Aristotle, and from which we derive the words agony, antagonism, antagonistic and and the less familiar words agonism, and agonistic. By her reading, cities, and the architecture of which they are composed, are at their best when they are agonistic. Certain contested and/or divided places, such as Jerusalem, Beirut, Nicosia, Sarajevo and Belfast bring the agonistic city into sharp relief. But she argues that conflict is embedded in any city, as part of the “urban order” (214). She’s keen to distance agon from the conventional view that it inevitably involves antagonism between factions that have entrenched positions. Nor do cities with polarised populations present the best examples of the agonistic city. She also notes that courts, assemblies and parliaments, are “based upon agonistic principles and practices” (215). “Place, by being structured in everyday activities rather than regulatory systems, can begin to open a territory where the necessary flexibility of agon can exist, with all of its paradoxes and ambiguities. It is in the combination of the two, rooted in both the everyday life and political possibilities of cities, that agonistic practice may find a home” (222). This for me this is a good place to start thinking about “interactive architecture,” to which networked digital technologies can provide assistance. It’s an architecture that gives space to public life and the workings of agon. Pullan, Wendy. 2015. Agon in urban conflict: Some possibilities. In Henriette Steiner, and Maximilian Sternberg (eds. ), Phenomenologies of the City: Studies in the History and Philosophy of Architecture: 213-224. Farnham, England: Ashgate. Wiberg, Mikael. 2015. Interaction design meets architectural thinking. Interactions, (22) 2 (February), 60-63 (http://doi.acm.org/10.1145/2732936). The first image above is of the border crossing between the Turkish and Greek parts of the city of Nicosia. 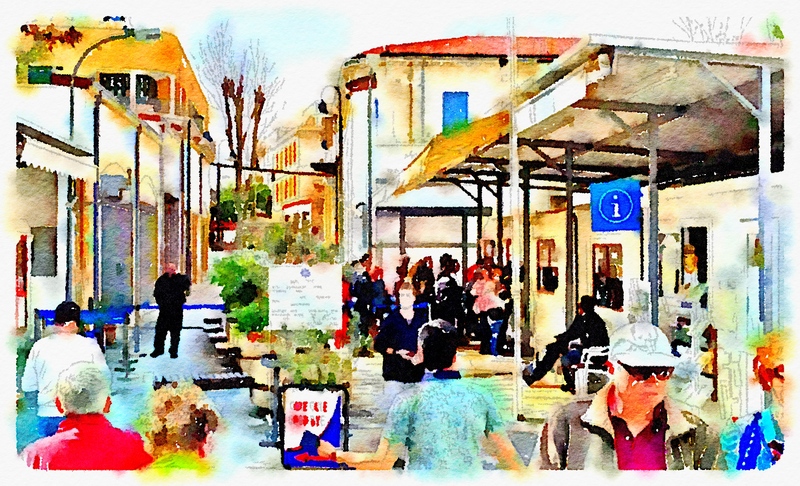 I’ve processed the picture with the iPhone Waterlogue app to conceal identities. The second image below is an old sentry box on the Greek side of the city.